John had in his words an “epic” fishing day recently, easily landing this 50 pound Blue Fin Tuna. This is fish is sushi-grade – rich and buttery. 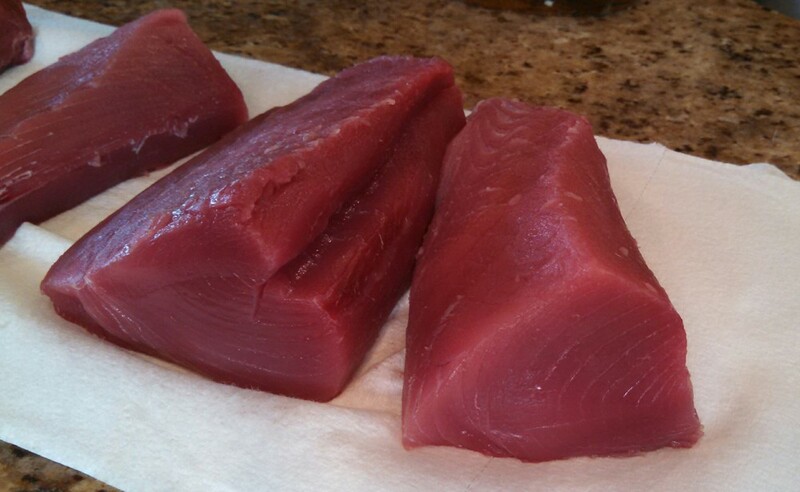 John calls it the “filet mignon of tuna.” He also caught a couple of yellowtail. John and his brother Bill devoured the tuna tartare I put together as a snack. The tartare is super easy. Chop some of the tuna and an avocado in very small cubes. Add finely chopped green onions, a few squeezes of fresh lime juice, a little soy sauce, sesame oil and a couple of dashes of Sriracha. Sprinkle on some toasted sesame seeds. The beauty of this dish is that it can be tailored to your tastes and what you have on hand. No Srircha? Substitute hot chili oil and don’t add sesame oil. Like it spicier? Mince in a little fresh jalapeno. I like to serve it with plain water crackers to allow the flavor of the tuna to be the star.